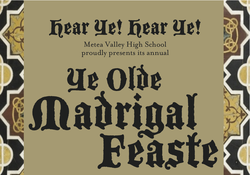 Metea Valley will once again present its annual Madrigal Show in December. This Dinner Theatre Production will feature over 40 madrigal singers, Jesters, Metea's Royal Brass Ensemble, String Ensemble, and Recorder Ensemble. Enjoy a Yuletide Banquet at the Metea Castle with the merry sounds of Christmas and the Renaissance!